To excel in any exam one has to prepare for the exam with a lot of dedication and strategy. Majority of the skills required can be honed by coaching and proper guidance. Thus it is important to join a course with a good team of faculty and a good record of preparing students for the concerned course. 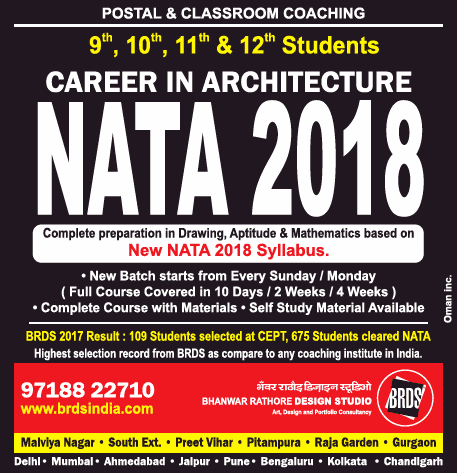 You should be ready to do rigorous research before deciding where to join and prepare for your entrance exam and then join one of the best coaching classes for NATA in Jaipur. * Mentors: Institute has one of the best faculty members which are fully dedicated and are focussed towards student development. * Centres: Arkin has highest number of institutes thus providing students easy approachability. * Creative: Institute helps in instilling creativity which is the primary requirement for these courses. 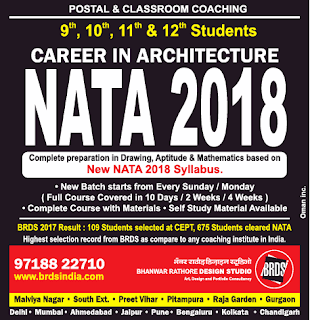 • BRDS (Bhanwar Rathore Design Studio): The Institute has earned its name over the years by producing consistently good results in various courses like NATA, CEPT, JEE, etc. The institute has been regarded amongst the best coaching classes for NATA in Jaipur with an experience of more than 11 years. * Course Material: Course material for the NATA entrance exam has been designed with lot of introspection and has been revised from time to time to keep pace with the changes. *Faculty: It has a team of experienced, qualified and dedicated teachers. *Result oriented: Institute uses manual as well as digital methods for teaching. *Facilities: Institute has very nice facilities with wifi enabled campus and accommodation for outside students. *Regular assessment: Curriculum is designed in such a way so as to regularly assess and test the learnings of the students. • Architecture and Design Academy (ADA): The Institute has been providing coaching in the field of architecture and design since 2007. The Institute has its branches across India. The Institute boasts of dedicated faculty members who are trained in their respective subjects and have a good industry experience as well. The Institute also has a good infrastructure to help students get attuned with the practical aspect, digital technology, wifi enabled campus, and all of this enables students to learn faster. • Inspiration (art and education): Inspiration institute provides education to the students who are preparing for Architecture, Design & Art. The institute prepares students for exams like NATA, NID, NIFT, UCEED and JEE (B.Arch). The institute is spread across various parts of Rajasthan with a rich alumni base which are part of some of the top architectural institutes across India. Along with a good study material and experienced faculty, the institute helps in preparing students by series of tests, previous year papers and mock tests to help students get the feel of real entrance test environment.